Do y'all have a favorite dish that you cook? Cooking is something that has been at the heart of our family for generations not only as a means of sustenance, but also as a time of sharing, laughing, and learning together. Watching my grandmother in the kitchen was one of my favorite things to do whenI was growing up. I wouldn't trade those memories for anything. I don't have a favorite thing to cook but I do enjoy preparing meals that I know are someone's favorite. For example, I know Breezy loves shrimp creole so I love making that for her. Everyone loves my bourbon shrimp and grits so I love preparing that dish for the family and for friends. Birdie loves my chicken and dumplings, so I love making that dish for her. My favorite dishes to cook are those that I know are quite pleasing to others. It's one of the few ways I feel I'm doing something special for the people I care about. I learned to cook from my mother and grandmother. There were no two better cooks as far as I am concerned. I loved everything my grandmother cooked and most of what my mother cooked. Mother tried a couple of recipes that I could have done without. One was pork chops with some sort of sauce and raisins and the other was this corned beef and mixed veggie dish. I was not the least bit fond of either of those two dishes. (I think she liked to try the new recipes of the day. Some of them bordered on fancy and, as y'all might recall, I am not a fan of fancy food.) Learning from the two of them was like being a musician who can read music and play by ear. I learned to follow a recipe from my mother and to 'play by ear' from my grandmother. I believe that makes me a better cook than following one way or the other. As a matter of fact, that is why my shrimp and grits are so delicious. I have a recipe, but I made it my own by adding and subtracting a few things that I thought would make them better. I remember spending an inordinate amount of time with my grandmother in her kitchen which has led to some of my most cherished childhood memories. I don't think Grandmother owned one single cookbook. She did write down recipes in spiral composition books but you had to be careful following those recipes. What Grandmother failed to do is write the 'real' recipes down. 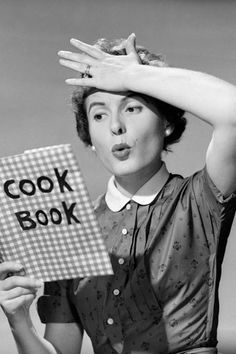 The little changes that she made that resulted in the perfection of the recipes were not written down on those pages stained with butter and flour and other secret ingredients. I don't think she did this to trick us, she just went into her creative mode when cooking and never thought to write anything down. This is why not a single one of us has ever been able to reproduce her mouth watering recipes to this very day. This is the way I cook, too. And now I am frustrating my children. And, at times, I'm frustrating myself when I try to reproduce a particularly good recipe. Not those shrimp and grits though. That one is in my head and they are perfect every time. I also learned, from Grandmother, how to add ingredients without measuring. We measure by feel and taste and by 'just knowing' how much is the right amount. We have Grandmother's spiral composition books and Reni is working on figuring out how Grandmother made her yeast rolls. Reni is stubborn and she's been working on these delicious rolls for a few years now. The last few times she made them, we noticed that she is closer than ever to getting them like Grandmothers. We think part of the secret is in the kneading. Grandmother also taught me not to be afraid to try new recipes. She did it all the time. But she made her own tweaks to these recipes so I have no idea what the 'real' recipes taste like. It's the same at my house. I always tweak. I don't think I am capable of cooking without tweaking. The good news is, it works. Yep, definitely a tweaker here. My niece once complained that she couldn't make a recipe of mine because she thought I left out several steps. I think after years of cooking, one tends to just do things and forget that others might need steps A1, A2, A3, not just A,B,C. Lol. I suspect you're right about the kneading. My grandma always said that when you think you're all done kneading, knead it another 10 minutes. :-) I'm glad i learned to cook, not just follow a recipe. When a person knows how to cook, you can usually look at the available ingredients and figure out Something. :-) Fun post, Pam. I knew you were! You can't create that much goodness that I see in your posts without knowing your way around the kitchen! Your grandma sounds just like Grandmother. I sure do miss those kitchen times with her. Thanks! Yes, Pam, I am a tweaker and it drives Joe crazy. I make something and he loves it...next time I make it, it might be just a little different and he notices. He says I should stop making JALC...just a little change...and leave it alone! LOL I can't duplicate Granny's fried chicken or my mom's homemade noodles. Not possible. I can't duplicate much of anything that Grandmother made. Fortunately, Mother is still here so we can still enjoy her cooking. I have a couple of recipes that are different every time and they notice too. This could all be solved by them doing the cooking. Which will never happen. LOL Thanks! I enjoy cooking and both of my daughters enjoy it too. My mother is known for her cooking and I learned by watching, helping, and eventually trying and tweaking. I am always a little surprised at the number of women I meet who do not cook at all, who never learned to cook. My mom learned from her mom and I taught my girls the same way.